Excellent article in Wall Street Journal about SBA bailout program (click here) for small businesses, banks just getting information now according to Myung Oak Kim from Governor's Economic Recovery Team. 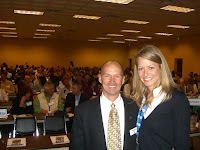 I heard Kim at workshop yesterday sponsored by Hewlett-Packard and SCORE that I helped promote.In photo: Michael Nordstrom, Hewlett Packard, and Margaret Shaw, SMA Global with the more than 300 Denver-area small business entrepreneurs that met with SCORE, the federal government’s small business counselor organization, at a free small business workshop in Denver yesterday (June 11) at the Denver Merchandise Mart. Topics covered included: New Colorado Stimulus Package Opportunities; Disaster Planning to Protect Assets; Going Green for Profit; Essential Marketing; and Forbes new America's Most Promising Businesses series. Would you share your startup experience with people who are starting down a new path as they begin a new career, new campaign, or new business? Each Friday I need 2 or 3 people to share at the Denver IDEA Cafe. If you'd be willing, contact me at John@JohnWren.com or (303)861-1447. Thanks! There is an interesting column by Gov. Bill Ritter in the Denver Post this morning. Whether you support Gov. Bill Ritter for re-election (as I do) or you want to change horses, in Colorado you get a chance to make a big difference every two years with our wonderful Colorado Caucus. I say it's wonderful because it's the best way for the average person like me (and you?) to get elected to local public office. That's why most of the rich and powerful look down their nose at the system. When you have all your ducks in a row, you don't necessarily want a lot of new ducks joining you! Go to your local caucus in 2010, get involved with your neighbors, and by 2012 you could be running for office yourself, as some are now who attended their caucus Feb 5, 2008. We had a groundswell of participation in 2008, and that should mean good things for Colorado, if our major political parties are open to the new voices, and our newly engaged citizens follow through. John Wren, Co-Founder, Save the Caucus which defeated Amendment 29 in 2002. Just about every college and school district pushes their bricks and mortar with the claim that their school changes lives. I organize adult self-directed learning groups based on what Ben Franklin and his friends first started back in 1727, what may have been Franklin's greatest invention. In today's world education is manditory, but schools are optional.